Prezacor is excited to announce our new odorless, gentle and medicine-free Energeze Back Patch! 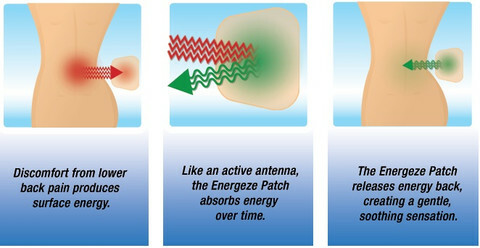 The Patch provides natural, soothing comfort for your back and other parts of the body using a unique proprietary formula that absorbs energy from the surface of your skin at the site of pain. Prezacor’s specially-developed adhesive formulation provides extra support and stability for muscles and joints, giving you a natural form of pain relief. At Prezacor®, we develop all natural products designed to relieve aches and pains to help you stay active. Our odorless, medicine-free technology uses your body’s natural energy to ease discomfort without side effects. Our team of physicians and scientists is dedicated to developing non-pharmacological pain management solutions that improve health and well-being for active adults, including the all new Energeze® Back Patch. What are People Saying About Energeze?